Papers: 1963 August 8 and 1991 November 26. 2 items. Letter re possibility of running again for President and letter detailing Jewish heritage. Papers: 1880s-2008. 1180 linear feet and 472 microfilm reels. Personal and political papers including general, political, and constituent correspondence, legislative files, committee files, reports, invitations, speeches, news articles, press releases, schedules, campaign records, voting records, scrapbooks, photographs (30 linear feet), and 204 cassettes, films, records, and tapes. Arranged in five series: personal, presidential campaign, legislative, constituent services, administrative, media, and artifacts, memorabilia and oversized material. Topics include Arizona subjects, John Birch Society, conservatism, civil rights, Indian affairs, military affairs, Central Arizona project and water issues, politics, 1964 presidential campaign, and military affairs. Some restrictions, contact repository. Over 5000 color slides of Goldwaters presidential campaign, 150 scrapbooks of news clippings, rare photographs, and microfilm have been digitized. Goldwater Fine Arts photographs and Historic photographs are fully catalogued. Finding aid available online. 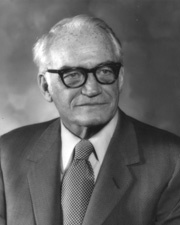 Additional Papers: In Goldwater family papers, 1828-1989. 37 linear feet. Correspondence, documents, business papers, and memorabilia. Papers: 1875-1968. 4 inches. Materials relating to career and family, speeches, clippings, and a few business papers. Additional Papers: Correspondence and campaign records in Dean Burch papers, 1963-1968. Papers: 38 audiotapes (1961-1975) in Westinghouse Broadcasting Company collection, 1945-1981. Oral History: Discussed in William B. Ross interview (1990), 322 pages; and Herbert M. Baus interview (1989,1990), 323 pages. Name indexes. Papers: Correspondence in Clarence Manion papers, 1922-1965. Finding aid. Papers: In Strom Thurmond papers, 1840-ongoing, scrapbooks and campaigns series. Oral History: 1967. 1 reel; 81 leaves. Chiefly concerning presidency of Eisenhower; Senate Campaign Committee; Republican party; and impressions of Sherman Adams, Richard Nixon, Lyndon Johnson, Robert Taft, and William Knowland. Goldwater also is discussed in several interviews. Papers: Correspondence in Spruille Braden papers, 1903-1977; and Stein and Day Publishers records, 1963-1988. Papers: 1964-1965. 8 reels positive, 8 reels negative microfilm. Largely 1964 campaign letters, newspaper clippings, pamphlets, and other materials from various sources, including Republican National Committee members, national and local political figures, and individual voters and their children. Subjects include conservatism, the Republican Naional Commmittee, gun control, medicare, civil rights, and the John Birch Society. Additional papers include transcriptions of campaign speeches in Republican National Committee public relations records, 1913-1966 (bulk 1960-1966), permission needed; correspondence in Deane Waldo Malott papers, 1894-1984 (bulk 1959-1992); Karl Douglas Butler papers, 1931-1984; F. Clifton White papers, 1952-1970; Lincoln Republicans records, 1964; and Frederick Boyce Bryant Republican party correspondence, 1956-1967. Oral History: August 8, 1972. 6 pages. Papers: Correspondence, audio tapes of speeches, advertisements, clippings, and ephemera relating to Goldwaters 1964 presidential campaign in Luke G. Williams papers, 1946-1983. Oral History: 1967. 81 leaves. Copy of oral history at Columbia University. Papers: In Ralph McGill papers, 1853-1971. Papers: In Maurice du Pont Lee papers, 1900-1973 (bulk 1952-1972); Pew family papers, 1817-1965; and Jasper E. Crane papers, 1893-1970. Papers: In Roscoe Pound papers, 1888-1964 (bulk 1910-1964). Papers: 1938-1964. 2 folders. Letters to and from Hoover. Oral History: 1971. 11 pages. Papers: In Susan McWhirter Ostrom papers, 1843-1980. Papers: In Kurt F. Pantzer papers, 1878-1979. Oral History: 1971. 38 pages. Closed. Oral History: 1965. 27 pages. Closed. Papers: In Charlton Havard Lyons papers, 1942-1973. Papers: Over 550 entries on the National Archives On-line catalog (http://www.archives.gov/research/arc/) including textual, sound recordings, photograph, and moving image collections at the Washington DC archives and Presidential Libraries. Papers: In William John Fielding papers, 1912-1973. Papers: 1959-1965. Ca. 2.5 feet. Speeches, interviews, and press conferences in Record Group 15, Nelson A. Rockefeller, Gubernatorial Series 22, New York Office, Subseries 2, Campaign for the 1964 Republican Presidential Nomination. Papers: Correspondence in Thomas Barnett Huff papers, 1907-1968. Papers: Correspondence in Thomas R. Waring papers, ca. 1950-1977. Papers: In Manuel Ruiz papers, 1931-1986. Papers: In William Howard Lawrence papers, 1936-1972; William J. Grede papers, 1909-1979, written permission needed until 1999; Thomas E. Coleman papers, 1914-1964, restricted; Republican Party Wisconsin records, 1938-1988; Wisconsin Governor Reynolds records, 1954-1964; David Schoenbrun papers, 1963-1978; Morrie Ryskind papers, 1927-1978; Richard Halsworth Rovere papers, 1931-1968; a sound recording, The dynamic philosophy of a great American (1964); Clark R. Mollenhoff papers, 1936-1990; Robert MacNeil papers, 1956-1988; and Wayne J. Hood papers, 1947-1968. Papers: Correspondence in George Francis Lemble papers, 1958-1968; George Wilcken Romney papers, 1939-1973; and Stella Brunt Osborn papers, 1916-1983. Finding aid. Papers: Correspondence in Jack Bell papers, 1937-1940. Papers: Correspondence in Granville F. Knight papers, 1920-1981 (bulk 1960-1075); and Ashley E. Holden papers, 1910-1976. Papers: 1949-1965. 31.75 feet. Campaign files for Goldwaters 1952 and 1958 Senate campaigns and 1964 presidential primary effort in the Stephen Shadegg/Barry Goldwater Collection. Finding aid on-line. Papers: In Woodford McClellan papers, 1969-1978 (bulk 1972-1978); and Hugh Scott papers, 1925-1983. Finding aid. Papers: Correspondence in Eugene L. Vidal papers, 1924 1969. Finding aid. Papers: In Max Lerner papers, 1927-1980; Firing Line With William Buckley transcripts, on microfiche; John Sylvester Fischer papers, 1907-1980; George Howard Edward Smith papers, 1917-1962; and Hanson Weightman Baldwin papers, 1929-1988.